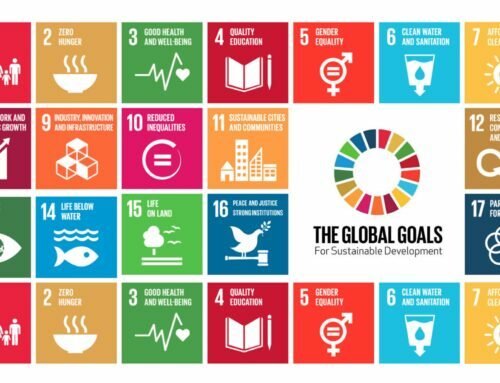 This August as the Olympic torch dims, The Global Summit will light up it next transformational conversation on the front lines of social change. After years of Rio’s local issues being side-lined by mega events, ‘THE GLOBAL SUMMIT V: Empowering Humanity through Transparency’, will illuminate solutions around everything from climate change to expanding equal access to education. 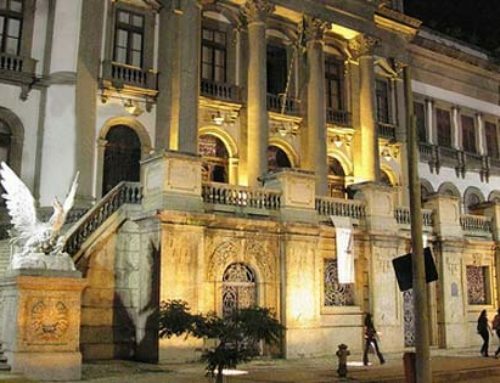 Rio de Janeiro —August 23-26 at the Museu de Ciências da Terra, a California based social innovation forum called The Global Summit will convene 200 community, business and cultural leaders with a focus on the most pressing social, economic and ecological challenges facing Rio and Brazil and how that affects the world. Wrought out of a unique intersection of Indigenous, colonial and African culture; corruption and elitism amidst the potential for burgeoning economic growth; and a wealth of natural resources and biodiversity – Brazil enjoys a unique national identity whose allure is punctuated by dance, soccer and the stark contrast between rich and poor. Indeed, the nation is a veritable melting pot of striking contrast – from oil and cattle prospecting to environmental activism; from horrendous violence to a global model for cross-cultural transformation and harmony; from breathtaking natural beauty and biodiversity to rampant urban squalor; and so on. And, as much as the setting straddles so many human faultlines, it provides the perfect backdrop to an ongoing dialogue from the front lines of social, economic and environmental change. In providing 30 full scholarships to youth and community leaders, the summit invites representatives from the very communities that have been displaced by the Olympics in Rio’s favelas, as well as the 2015 ecological devastation from mining activities in Minas Gerais. Preceded by a cultural reception August 23, the three-day interactive, bridge-building program unites leaders across six key sectors: Art & Music, Media, Business, Education, Nonprofit, and Social Entrepreneurship in Challenge Teams with the end goal to co-develop tangible policy, technology and on-the-ground outcomes by day three. Two selections in each category (made by live & live-stream voters) will advance to an integrated hackathon for prototype development by designers, coders and playmasters (Aug 27-28). 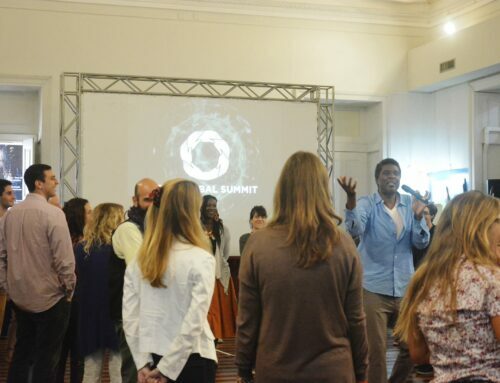 With renowned facilitators such as Ashoka fellow Edgard Gouveia Jr, (co-founder, Instituto Elos, Play the Call, Cooperative Games) galvanizing collective action, the summit promises to be anything but a spectator sport. Personalizing the 2016 theme of Transparency, facilitator Gian Taralli (SWARMS), who aids some the world’s largest companies with empathy based collaboration processes, will venture beyond issues of political corruption to explore how transparency plays in interpersonal communication and business. When asked what her interest is in joining, 2016 Delegate, Mayara Bernardes, who works in São Paulo City Hall, wrote in her application: I find it irresistible to think about the future of humanity because I’m sure I can help to improve it. 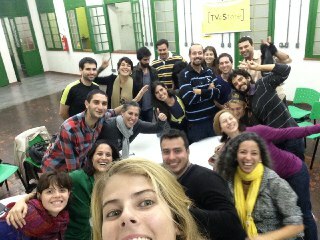 I feel that the State and the Brazilian society, as a whole, need innovation. The State is paralyzed with old practices and corruption. We urgently need fresh ideas and a new way of acting. I am totally convinced that I must work to create a change in my country. 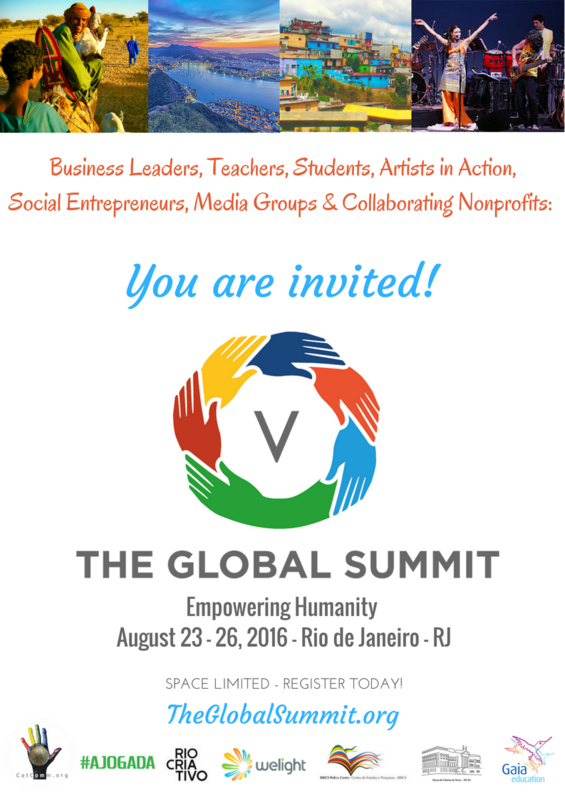 I am also sure that I am capable to find the correct tools for that by participating in “The Global Summit V”. Pedro Paulo Lins e Silva, a Brazilian technology entrepreneur, startup advisor, and founder of Linkzter, Welight.co and innovative third-sector initiatives that support indigenous communities in the Amazon, states: “This is the time for everyone to awake for the infinite power we all have when we understand our mission to serve humanity and the planet, and use our hearts and technology to unite with others that already share the same purpose. The Global Summit is the perfect opportunity to empower the highly creative people from Brazil to build tools and execute social and environmental impactful actions, in a moment that union and transformation is much needed in order for liberating the huge potential for a harmonious and society-driven development of the country”. 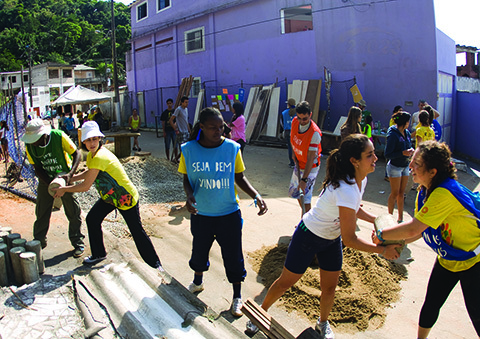 While the summit is led by California based nonprofit, Empowerment WORKS whose founder has been building a local team in Rio since March, the event has been coming vibrantly to life with the support of over 30 local volunteers and diverse pro-bono production partners such as Serviço Geológico do Brasil, the BRICS Policy Center, Catalytic Communities (Rio on Watch), GreenHub (event greening & production), #Ajogada business gamification association along with social innovators from sustainability minded incubators including Goma, Impact Hub, Rio Criativo and Startup Rio. In the spirit of co-creation, all participants, including Featured Voices (aka speakers) are invited “to bring the best of their gifts to the table to build a better world for humanity”. With it’s 2nd biennial meeting in a row to follow the Summer Olympics in Rio, and 7th Summit on track for Tokyo in 2020, The Global Summit is on a long-term journey to bring the spirit of mass-collaboration to billions under the Olympic spotlight. Ultimately, despite concerns around elevated crime levels, Zika, water pollution, political and economic upheaval and social unrest; the first South American Olympics will go on, and so will The Global Summit V.
Since its 2008 launch in San Francisco, the Summit has been a magnet for sustainability pioneers including John Perry Barlow (co-founder of the Electronic Frontier Foundation-EFF); Hunter Lovins (founder of the Rocky Mountain Institute); Gunter Pauli (author Blue Economy, Ecover CEO); Barbara Marx-Hubbard (Buckminster Fuller protege & futurist); and Prof. Jan Knippers Black (Amnesty International Board Member, Adviser to the Inter-American Foundation); Traci Fenton (Founder and CEO of WorldBlu), Joan Blades (co-founder, MoveOn.org & President of MomsRising.org) Betsy McKinney (Founder, It’s Time Network); Warren Brush (Co-founder, Quail Springs Permaculture/ Community Resilience Storyteller), Scholastica Sylvan Kimaryo (Conscious Leadership expert/ fmr UNDP Africa leader), and more. 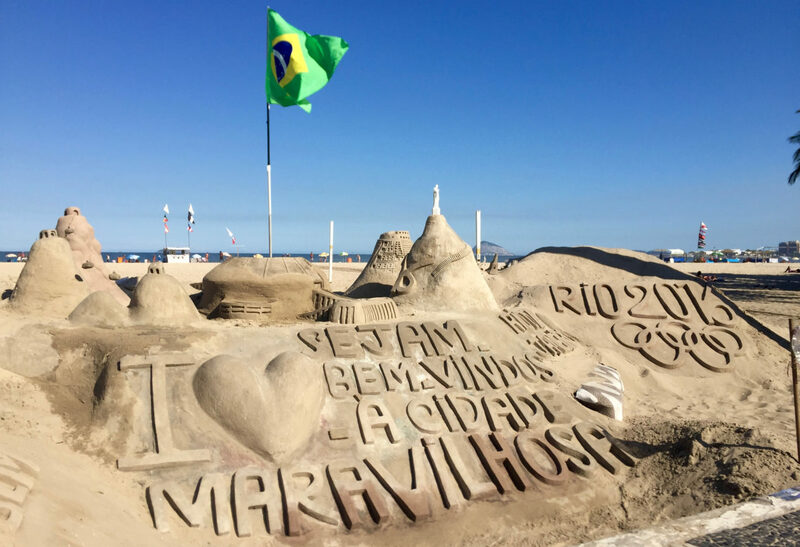 While the bilingual Rio event is limited to 200 delegates, The Global Summit extends its global reach through live-stream, connecting to partner-led Local Summits currently being planned in the US, Africa and Asia. The Summit has a Supporting Partner program which serves to leverage the Olympics in showcasing the positive leadership of partner organizations. Find 2016 Supporting Partner Opportunity PDF here. From R$375 for students to R$2475 for patrons. *Invite only event responds quickly to Applications. 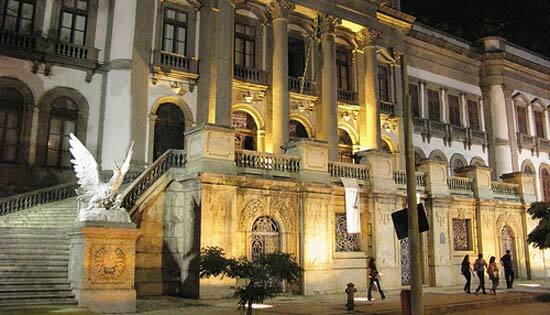 The Celebration ignites August 23rd at 6:00pm at the Museu de Ciências da Terra, a magical evening of music, dance and world cuisine. Starting with a Global Voice Welcome from Scholastica Kimaryo (Tanzania), each morning will open with a facilitated program of presentations, panel discussions and interludes from the frontline – fostering dialogue engineered to create and inspire continued collaboration beyond the summit. 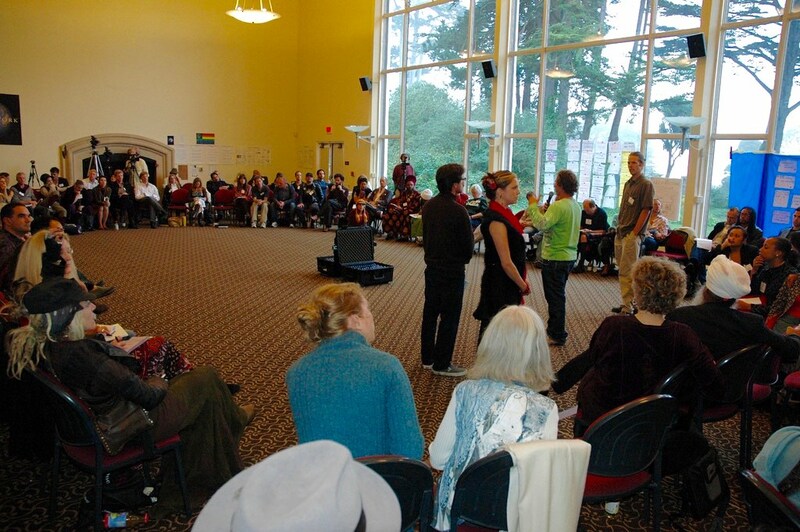 The rest of each day will consist of two breakout sessions across four Intersection Tracks – an opportunity to share ideas, skills, tools and stories so as to advance collective impact, guided by the 7 Stages to Sustainability (7SS) social innovation framework. 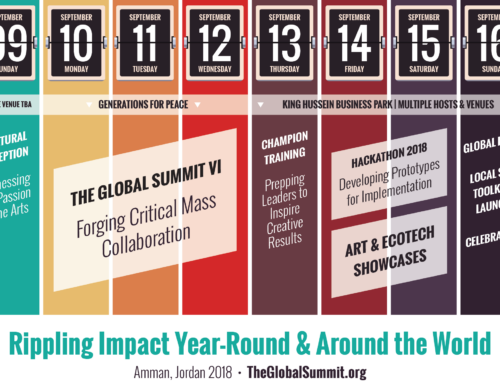 Launched in San Francisco in 2008 as a core program of global sustainability think-tank in action, Empowerment WORKS, The Global Summit biennial attracts some of the world’s most innovative social, economic and environmental pioneers and provides a ready framework for participants to take their work to the next level. With an expert facilitated interactive program, delegates build relationships with key collaborators moving forward, expand their capacity as change-makers and learn diversity of skills represented in the 7 Stages to Sustainability innovation roadmap and learn how to create value-added collaborations by better understanding diverse assets and needs of the six Partners In Empowerment (PIE) sectors: Artists, Media Groups, Education, Business, Nonprofit, and Social Entrepreneurs. The event is organized by Empowerment WORKS in collaboration with many inspiring partners, including Museu de Ciências da Terra, Serviço Geológico do Brasil, welight.co, #Ajogada, the BRICS Policy Center, Gaia Education, Cernunnos Media, Rio Criativo, Startup Rio, Catalytic Communities, Community in Action, Musical Activist Alliance, Bioneers, among others. 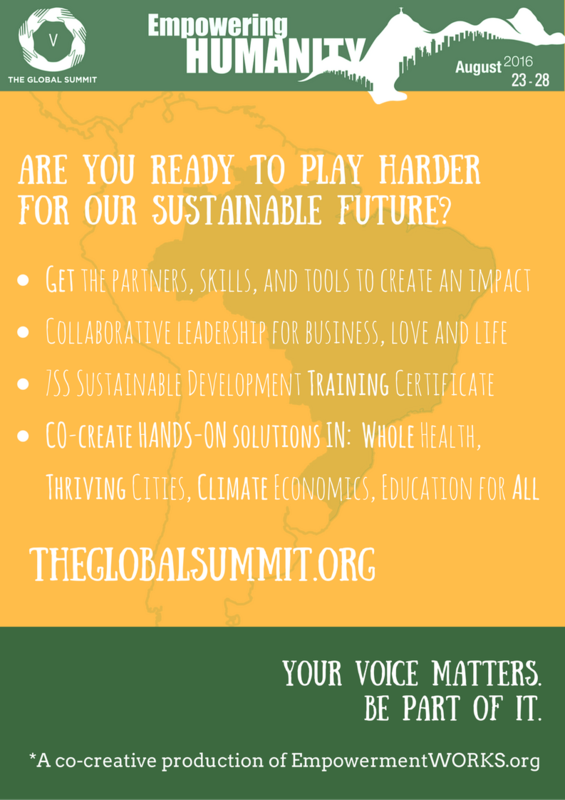 See www.TheGlobalSummit.org for growing list of Partners and Featured Voices. 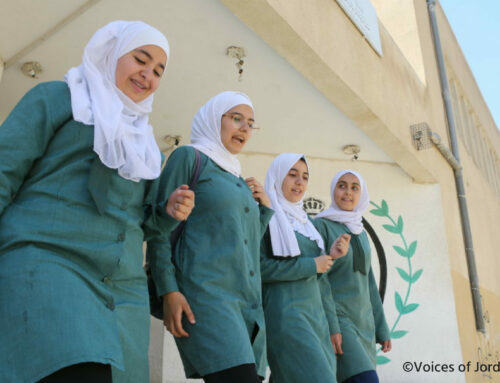 Promoting world-wide community participation, The Global Summit virtual tools include, live stream of larger plenary sessions; unlimited access to interactive video recordings of the full summit (as well as previous events), a collaboration portal to support and track 2016 outcome goals.